I am Venkatakrishnan J, a Business Intelligence enthusiast working with Rittman Mead Consulting who likes blogging about acquisitions in the BI space, technical workings of the BI tools in general and Oracle Business Intelligence tools in particular. All the views expressed here are my own and does not reflect the views of Rittman Mead Consulting or Oracle. Going forward, i would be blogging at http://rittmanmead.com/blog. In one the recent Essbase implementations that i did for a customer, there was a customer need to kick start Essbase related data load, aggregation etc through a web based console. Since the customer had Oracle E-business suite and was most familiar with the use of concurrent manager, i had created a set of concurrent programs to submit various Essbase related data loads(through the use of SSH, MaxL & shell scripts). Essentially, the end users can kick start an Essbase load process by submitting a concurrent request. But one of the questions that i was asked by the customer was whether Hyperion Product stack itself had anything similar to this. Thats when i had to explain the customer about the existence of Hyperion Business Rules which does more or less the same thing. But the advantage of using this component is that it provides a good graphical interface (it uses Java API) to design different business rules. For example, the typical requirement is to run various financial calculations during the end of a quarter again to ensure that all the numbers are correct. So, the business users would require the capability to dynamically pass month values from the front end. Hyperion Business Rules was built to address these kind of requirements. But one of the shortcomings that i found was the lack of a capability to run data load/dimension build rules. Right now, it has a sophisticated UI to define business rules which can just do calculations, allocations on Essbase as well as Planning. Hyperion Business Rules or HBR comes along with the Essbase Administration Services installation. It was a seperate product before but now it has been clubbed into EAS. 1. 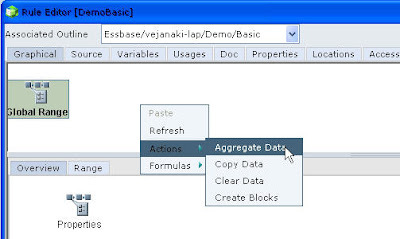 Rules – A rule typically runs a specific calculation/allocation on a single Essbase Database. It can be extended quite extensively to include advanced calculation scripts. 2. Sequence – A sequence basically helps in sequencing a list of rules based on business requirements. It basically provides an order to the Rules execution. 3. Macros – Macros are like mini rules which can be reused across multiple rules. 4. 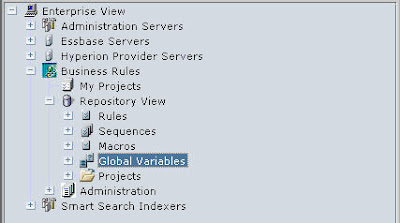 Global Variables – Global Variables are nothing but a set of variables that provide a global context to the variable values. Since HBR comes along with EAS, its security is derived from Shared Services. Each rule/sequence execution/validation by a user can be controlled through the shared services console. HBR is relevant only to BSO cubes as ASO cubes do not support calculation scripts. To start with lets create a simple rule on the Demo->Basic cube. The first step in creating a rule is to choose the outline. Now, right click on the Graphical Tab open area and choose either Actions or Functions. Actions provide the capability to run calculation scripts. So, lets choose Action and Aggregate Data. The UI of HBR provides the capability to calculate the entire database or portions of the database. For now, lets choose the entire database. There are also calculation optimization options like Aggregate Missing, Calc cache setting etc. But again not every setting is included. In order to run more complex scripts, just go to the Source tab and add accordingly. 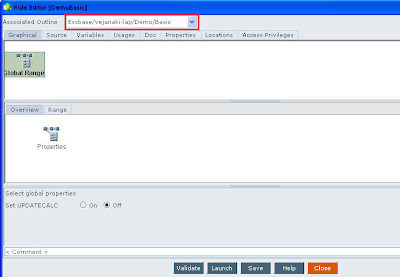 Then choose a location (the outline itself) and then assign privileges for users who can execute this rule. So, if you are doing an Essbase implementation and have requirements to provide end users with the capability run complex allocations/business rules from a thin client, HBR would probably be the best fit. Typically this is more used with Hyperion Planning.